Would you ever run a marathon breathing out of a small paper bag? So why ask your engine to rev all the way to redline breathing through the restrictive factory airbox? 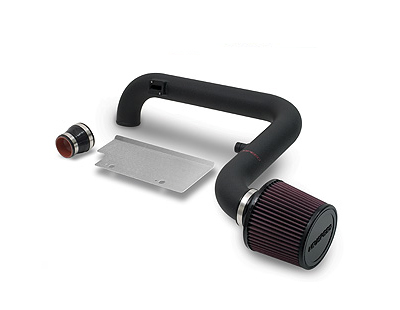 The plastic factory airbox is good at muffling intake noise and enhancing low rpm/low speed engine performance, but becomes very restrictive when the engine is operating in the higher rpm range ’ where most performance drivers need it. The NEUSPEED P-Flo allows you to uncork the intake side of your engine, drawing in a nearly unlimited supply of fresh air. Plus every P-Flo kit includes a high-performance, multi-layer cotton gauze air filter that is washable and reusable, and traps dirt better than your original paper filter. You also get a more agressive, deep throaty engine roar when you step on the gas pedal. 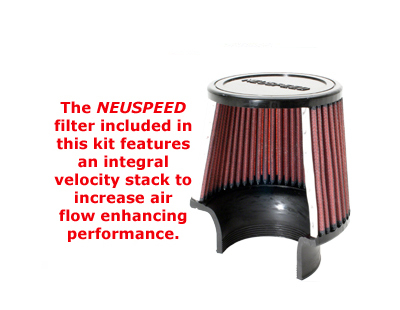 After months of development, NEUSPEED has developed an intake pipe size that matches the factory MAF exactly. Because of this fuel trims does not affected and will not trigger any DTCs. In addition, eliminating the OE plastic MAF housing showed an increase in airflow, as no pre-screen is required to reduce turbulence when air is routed through the long piping with its smooth mandrel bends. -Actual parts shown in photo. -As the OE engine cover is an integral part of the OE air intake box, it must be removed as part of the installation of the NEUSPEED P-Flo kit. -CARB EO D-236-11 when used in conjuction with NEUSPEED P-Chip Engine Management Software. -Now inlcudes stainless heat shield. -Does not fit Passat B6 2.0T with Automatic Transmission. Available in Black or Red. Please select below.